Chlorine pucks have been a popular way of chlorinating your pool for quite some time now. 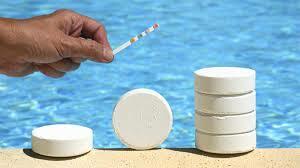 By using chlorine pucks it reduces your chance of forgetting to add chlorine since the pucks slowly dissolve over time. This ensures that your pool keeps a constant chlorin e level without much effort. All though this chlorination system is a life saver for some people, when not executed properly it could cause your pool more harm than good. Don't worry though in this blog we will show you how to use chlorine pucks efficiently as well as a few tips and tricks that might be handy. As mentioned above there are some ways where chlorine pucks can cause your pool some harm. The issue is that most chlorine pucks that are sold are stabilised. Stabiliser is a pool chemical that protects the chlorine in your pool water from the sun. The sun rays evaportate the chlorine just like it would do with water, so by adding stabiliser we ensure that the chlorine can stay longer in the water. As you might have concluded yes stabiliser is a good thing, but like most things in life its only good in moderation. Too much stabiliser could render the chlorine inefficent, not allowing it to kill the bacteria in your pool. So the goal here is to keep the stabiliser level in check. Now that you know what to avoid let us tell you how to avoid it. The more pucks you use the more stabiliser you will have in your pool. To control that all you have to do is control the amount of pucks that go into your pool. The amount of pucks that you use will depend on the size of pool that you have. This amount will allow your pool to have enough chlorine but will also keep the stabiliser in check. To know the exact amount of pucks your best bet is to come see us in store where we can give you a personilized plan that fits your pool, but on average you want to keep your puck use under three pucks a week. When it comes to chlorine pucks most of the work gets done by the dispenser. There are only two ways to dispense your pucks and that is with the use of an in-line chlorinator of a floating dispenser. Simply putting the chlorine pucks in your skimmer is something you should never do. Putting the pucks directly in the skimmer will dissolve them way to quickly and will send concentrated chlroine through your whole filtration system wearing it down very quickly. The first tip is if you are using a chlorinator. To ensure that your pucks can be used efficiently, you must control the flow of water perfectly. Although finding that perfect water flow is done by trial and error, our tip is that you sould mark your chlorinator where the control valve is. Just use a sharpie to make your reference point and you'll be home free. The second tip is if you are using a floating dispenser. By having the dispenser float around in your pool the pucks get disolved very slowly, most of the time too slowly. Our tip is to tie your dispenser to your stairs with a piece of string. The small current created by your filtration system will be enough to make the pucks disolve faster now that the dispenser stays in one place. If you are interested in finding out more about other chlorination systems you can click here.